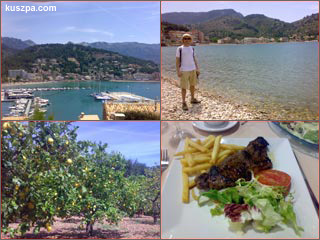 Orange plantation, Port de Sóller, me at the beach and good looking, but not very tasty dinner. My first walking tour (about 7.5 km one way) was through Sóller to Port de Sóller. In the Tramuntana mountains you will see very many orange and citron plantations. Port de Sóller it a small city surrounded by mountains with nice bays and a marina for yacht tourists. In the evening I had dinner in another restaurant in Fornalutx called „Es Tambor Pages Cafeteria Fornalutx“ and I go for a steak, but to be honest, the food look good, but the meat was not very tasty :o( And because in my opinion they didn’t have a pleasant atmosphere, I wouldn’t recommend this place.